5 Years experience endurance racing in Chumpcar World Series. 7 Years race car design experience through FSAE, as student and mentor at 2 top-10 teams. Day job in driveline research and new technology development at a major OEM. 4 Years experience endurance racing in Chumpcar World Series. 4 Years race car design experience through FSAE, 3 years in racing industry. Day job in defense vehicle structural engineering and survivability modeling. Bosch Motronic tuning specialists. GWR uses the SSSquidBoard, which allows the driver to switch between two different engine tunes on the fly. Ours has a custom high-rev, high power tune for setting fast laps, and a leaner-burning, lower-rev tune for fuel conservation. European car performance specialists, parts, and race support. Just opened a new shop in the garages at Watkins Glen. 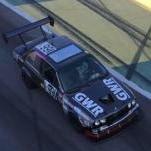 TLSS built the roll cage in GWR’s current racecar. Cheesecake! Whatever kind you can imagine – our favorite is a Bailey’s Irish Cream cake with Fireball soaked cherry topping. It’s delicious and may get you drunk. Based near Cleveland, OH, but ships to Detroit, Chicago, Pittsburgh, Columbus, and anywhere in between. GWR built engine with ram air inlet and side exit exhaust. 2 Chumpionship overall podiums, 10 total overall podiums, 1 overall win, 7 class wins. Lynn Bishop, Kristian Houghton, Misha Goikhberg, Erik Hardy, Stephen Della Monica, Ben Levesque, John Lankes, Denny Barker, Brian Silvestri @Scribe, Kyle House, Mary Bellino, Alessandro Pacifici, E. Tyler Pederson @Crank Yankers Racing, Nathan Gardiner @enginerd, Andrew Johnson @red0, and all the rest who have helped us along the way, apologies if I forgot someone. We couldn't have built 2 cars without your help! Chris and Will started racing together as freshmen on the University of Maryland Formula SAE team in 2008. Chris worked mostly on aero, leading the popularization of high-downforce architectures in FSAE. In his junior and senior years, he also took on significant suspension and vehicle architecture work, primarily as a means of making sure there was adequate space and clean air for the wings. By the end of his 4 years at Maryland, the cars were designed for aero first, everything else (including the powertrain, and the driver) was secondary. An FSAE skidpad (pure cornering) event win and consistent top 5 autox finishes demonstrated the effectiveness of this approach. Will worked primarily on the powertrain throughout his 4 years at Maryland, often re-packaging engine parts around the wings, and continuously trying to keep the engine cool without interfering with the aerodynamics. The powertrain worked OK, and the car occasionally won the drag racing event. After graduation, both Will and Chris moved to the Detroit, MI area to work in the auto industry. Will got a job in AWD systems new technology development at an OEM and started work on a graduate degree in mechanical engineering (along with more FSAE, this time doing suspension and vehicle architecture work) and Chris started doing advanced modelling and simulation work at a major engineering services company. Both bought rotary-powered track cars, and started doing track days. Because track days are relatively boring, within a year, Will had joined @Jamie's WRC Dropouts chumpcar team, and Chris joined the same team less than a year later. The car was fast, but rarely finished a race. When Jamie moved to California the first time, WRC Dropouts was disbanded, and Chis and Will decided to start their own team. With a cumulative 10 years of FSAE experience between them, and some professional racecar design experience for Chris, it seemed obvious to treat starting a ChumpCar team as an optimization problem. How do we maximize the number of laps turned in a given time, working within the constraints of the rulebook (and our own time and money)? After spending a lot of time staring at the then-new VPI sheets, Wikipedia, race results, and vehicle-specific forums, we narrowed the selection down to the BMW E30 and the 4th gen Camaro/Firebird. Final decider was cost, as the weight of the GMs would require significantly more fuel and more expensive tires to turn the same lap times. We spent a few weeks searching for any E30 325is, and eventually settled on a low-rust ’87 in Indiana. We got the car to the garage in October 2013, and spent the whole winter building for the Memorial Day 2014 Watkins Glen Race. The car as built for 2014 was simple. 205 wide tires, wood splitter/airdam, wood spoiler, and lexan windows. At the time, lexan was not free, and aero devices were assigned points based on square footage. The simple setup was intended to be temporary while we gathered some data on the car and its sensitivities to different design changes, but due to some persistent reliability (and driving) issues, we spent so much time fixing the car that we never really got to do much analysis. Nevertheless, the car did OK for a first season, with 3 top 10 finishes in 3 events. As good as that sounds, we weren’t the quickest car around, nor the quickest E30, so that was not acceptable. 2015 brought free lexan, which meant we took all those leftover points and built a much bigger splitter, and a wooden wing. Yes, wood. Birch veneer over a spruce frame. And that wing worked fantastically. We picked up our first track record at Gingerman (1:47.953), along with an overall win at MIS, a few podiums, and a 3rd place finish at the Eastern Chumpionship at PIRC. Still not the fastest thing around, but getting better. For 2016, we knew we were going to need more grip. The 205 wide tires were boiling in the corners. 225 wide was not going to be enough. We came very close to buying a set of 17x10 wheels and 255/40R17 Direzza ZII tires, and taking the 10 point hit for the wheel spacers, when Maxxis announced a 245/40R15. That was our tire for that year. The Maxxis wasn’t particularly grippy, but it fit a 10” wheel and it had a small OD – exactly what we were looking for. We put a set on for the first race at Watkins Glen, figured out the optimal tire pressure on the test day, and promptly blistered all 4 tires. Still didn’t have enough heat capacity. Eventually we figured out we could get them to last by shaving them, but it made the tires expensive. Oh, we also made the splitter bigger and integrated an underwing for 2016, vented the fenders, and made the car look a whole lot meaner. We knocked 3 seconds off our previous Gingerman track record, collected 5 more podium finishes, and threw away a second place at the Eastern Chumpionship with a bad strategy call, finishing 3rd. Over the winter of 2017, we set a goal to knock 5 seconds off our 2016 lap times. Wouldn’t be able to hit that everywhere, but it was the goal. A new tire, the Hankook RS4, came out in 245/40R15. It wasn’t as grippy as hoped, but it was just as grippy as the Maxxis, lasted longer, was cheaper, and had much better heat resistance. With little time before the Road Atlanta race in February, not much changed on the car other than the tires and some maintenance, but we still went for it. After running 1st and 2nd all day, we broke a ball joint with 2 hours to go in the 14 hour race. Car was certainly good, but needed to be faster, and we needed to be more diligent on maintenance. Over the next 2 months, we rebuilt the engine, moved the exhaust to the side to make room for an undertray, and got on the dyno to have SSSquid make us a tune. We didn’t get cooling with the underbody sorted out in time for Mid Ohio, but with the new exhaust and tune, managed to set a track record and finish 2nd overall. We finally got the slickbottom, RS4s, diffuser, new tune, and air dam on for Watkins Glen. This had been our target race – the first track we could directly compare race laptimes at. Less than an hour after the race start, Misha set a blistering 2:14.388 – our 3rd chumpcar track record, and 5.12 seconds than he’d gone on the same track the year before. We’d hit our 5 second bogey. 8 laps later we also hit another car, and then the wall. Hard. The car was a write-off, and we got to watch as the Ecotec Miata broke our newly-set record later that afternoon. The Little Speed Shop has a race support shop setup in one of the garages at Watkin’s Glen. The owner was there, and saw both our fast lap, and the crash. Turns out he had a rust-free 1987 325is shell sitting in the corner of his shop, seam welded and gorgeous cage already installed. After a few phone calls, We were back in Watkins Glen the next weekend to pick it up. 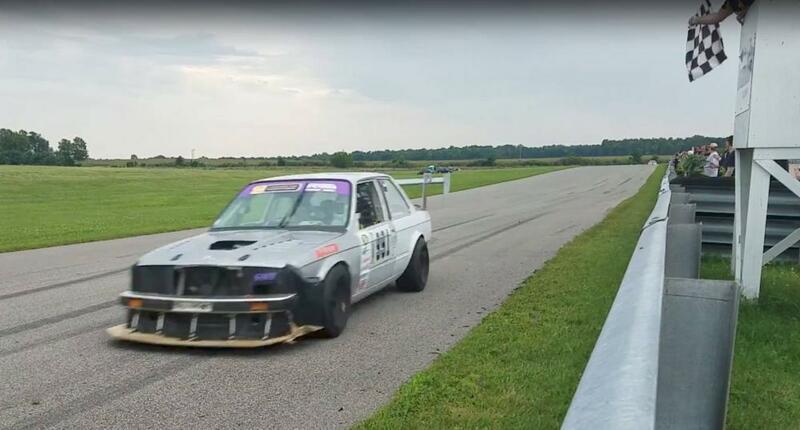 We spent the next 2.5 months working almost nonstop to rebuild all the custom parts we had on the old car, make the new one chump legal, get a new engine ready (old one bent all the valves), rebuild all the aero, and generally scrambling to get a car together in time for our home race, at Gingerman. On August 12, the new car showed up to a test day at Nelson Ledges, running but with no doors, brake lights, bumper, or fan, and driving almost sideways the alignment was so bad. We finished getting the car track ready in the paddock, got through tech at noon, and finally got on track around 1. We spent the next day and a half alternately doing shakedown runs and building the car. By the end of Saturday, the car had all its body panels, a good alignment, a wing, a fan, and a bumper. By the end of Sunday the piece of plywood in the trailer had turned into a splitter, and a roll of plastic into an air dam. By Sunday afternoon, the car was nearly running race pace. At 4:30 on Sunday, the shifter broke. Turns out it had cracked in the WGI crash. There were other things to fix, we packed it up, went home, and started prepping for Gingerman. And that’s where we are now. The car still isn’t painted, but by the time the Gingerman practice day rolls around on Friday, it should be chump-legal and race ready. If we’re lucky, there won’t be any problems, and we’ll go right back to setting track records. We will take Misha for 3 drivers to be named later and two future 1st round picks. I can supplement the deal with a couple bottles of fine scotch and contraband Cuban Cigars if needed. Call me and we can negotiate further. Friday happened at Gingerman. Car was pretty quick, easy 1:45s, even with a passenger and zero sleep. Crashed Saturday, and lost our track record to @cshay on Sunday, but that's ok, because WE WON!!!! I heard this thing spins to 9000 Rippums!? Maybe on a money shift lol. We have the rev limiter set to 7050 for races, have had it as high as 7250 in testing. GWR's Rachel build was/is the best Chumpcar I have ever raced. Tons of grip, shifter is tight, communication system (lights and radio) are thought out. The car is typically set up with some understeer which will keep you out of trouble. The wings and ridiculously large tires work. Is Rachel the new one? Rachel was the old car. New build is still unnamed. Because she's about to tear up south florida? So whats the secret to making power at 7K on an M20? Ask the Pro3 guys. Dan told me that the top guys would have the rocker arms magnafluxed and microscopically inspected and they would toss anything that had any cracks. It doesn't make much power up there. Peak is around 6k, and we're about 35hp below peak by 7k. We only run it that high to give the driver some flexibility with where on-track to shift. Our ideal 3-4 shift point is 6750rpm.